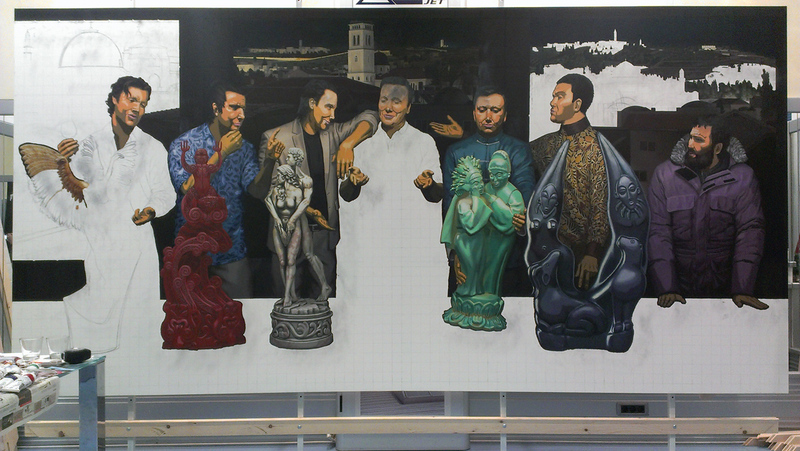 THE DEBATE OF SEVEN BROTHERS is an oil on linen painting, 400x200cm (13’2”x6’7”). 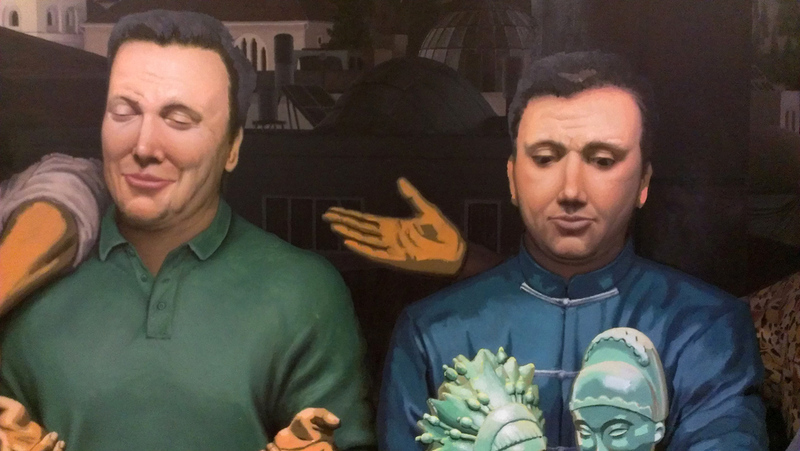 It tells the story of a family of art collectors from Jerusalem. 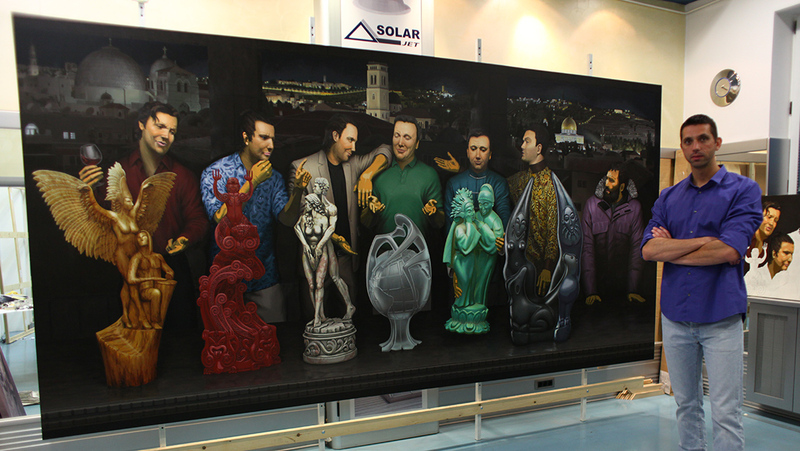 Seven brothers, who have decided to travel the world in search of art. They have agreed that each of them will travel to a single continent, and explore it to find the most beautiful piece of artwork on the subject of “A Man And A Woman In Love”. The painting depicts them as they return home, to Jerusalem, and gather to discuss the artwork they have brought. What they don’t see is that they themselves have changed, influenced by the cultures and civilizations they have discovered. So now they are still the same, still brothers. And yet they are all different. This is who we are, this is human nature. We are all the same, all brothers coming from one place. And yet we are all different, influenced by cultures and events that shape our lives. The culmination of the debate comes with the perspective of the last brother. There are seven continents and six are inhabited. To honor the deal the last brother had to go to Antarctica. There he didn’t find anything, but he learned a lot. Dealing with loneliness in a world without people, then coming home to meet with brothers, he is the only one who sees what others are missing. How can they argue over who is better, after being apart for so long. They should be happy to be together. This is the other aspect of human nature. When we are alone, we miss people. Yet when we are together, we tend to argue. Perhaps we don’t need to persuade others we are right all the time. Perhaps what we need is the will to understand each other. The painting is the result of my travels and life across the world and my passion for art. It summarizes a simple premise, which spins into a complex story. The story came to me spontaneously – in an instant breath – during layover in airport in Panama City, on a flight from Sao Paulo to Los Angeles. So far, I have been developing idea for two years, before working out design and making preparations for six months. 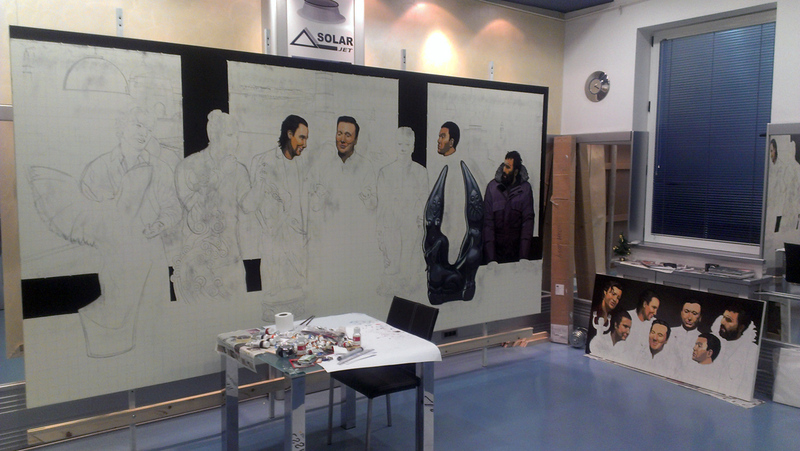 The actual painting process started in June 2014. March 2014 – Visited Jerusalem for photo shoots and research for the background motives. Three days of shooting from all possible angles, trying to combine all landmarks of the Old City. 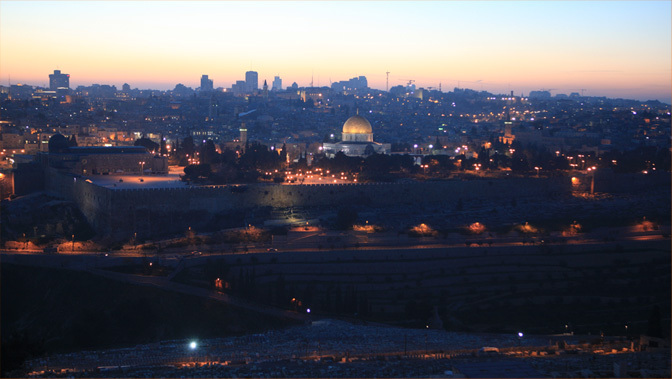 This is a nice sunset photo from the Mount of Olives. 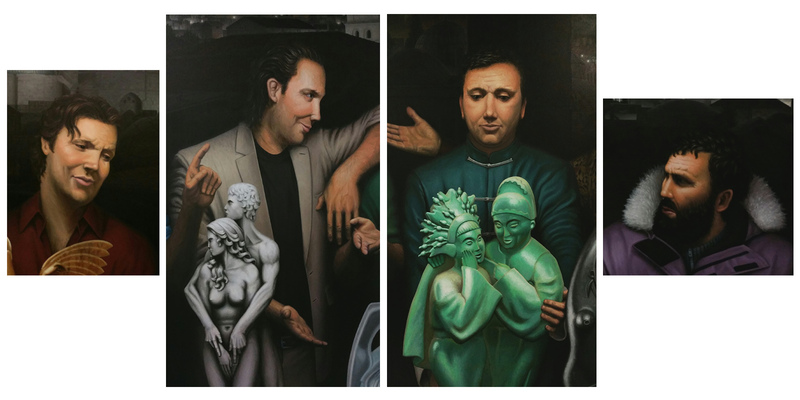 March 2014 – Finished photo shoot with my friend Oliver Conic in Los Angeles, to use as expression reference for characters in the painting. I did a quick test for the mood and color scheme. Sadly couldn’t manage to make myself finish the test, too eager to start working on the final thing. March 2014 – Bought all the material! 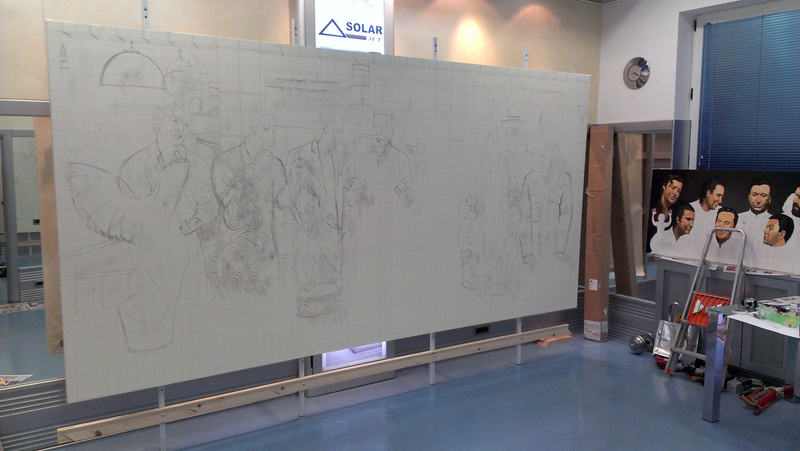 I will be painting on French Artfix linen canvas, quadruple primed – the roll is 500x216cm. I am using German DaVinci black sable brushes, they provide great control for detailed painting. 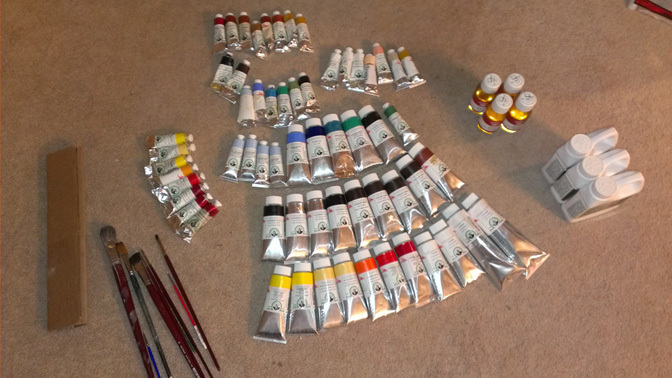 As for paints, I am using Old Holland paints. I have been testing them in last several months and they are simply amazing. 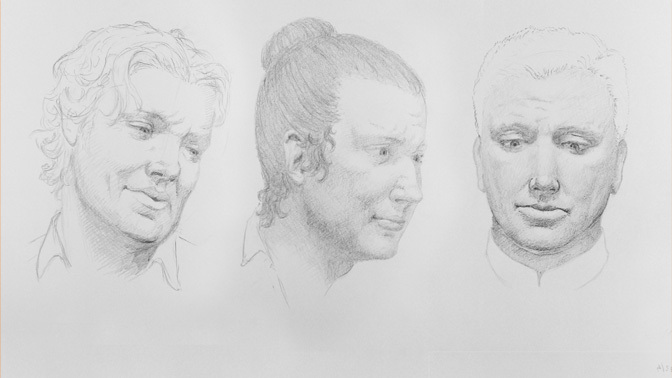 April 2014 – Did a lot of drawings for each face, both for expressions and for physical characteristics.I made a few versions for each character, then chose the best. 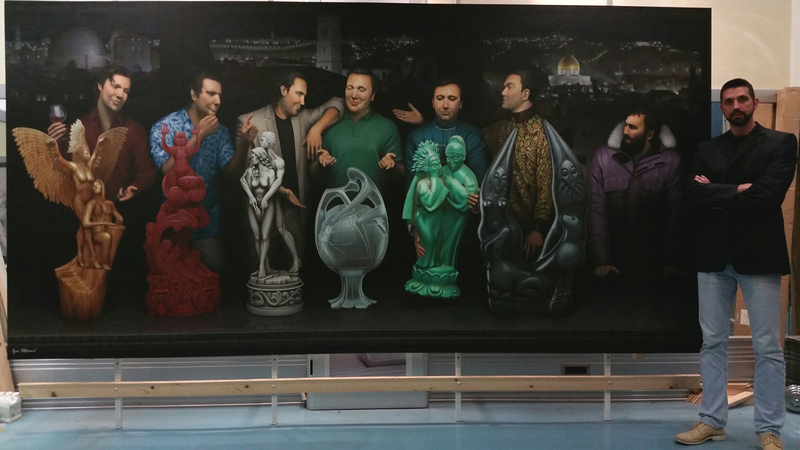 May 2014 – I have started first oil on canvas test, to see faces in full color – I ended up just doing a rough blocking of color, life size – 150x75cm. It turned out to be very promising, so I decided to stop, not to waste any more time and oil paints. At this point I am more excited to start working on final painting, rather than finishing test all the way through. May 2014 – After a few week of trial and error, we have finally produced and assembled the stretcher bars, they are 400x200cm. I have finally realized the scale of the whole thing. 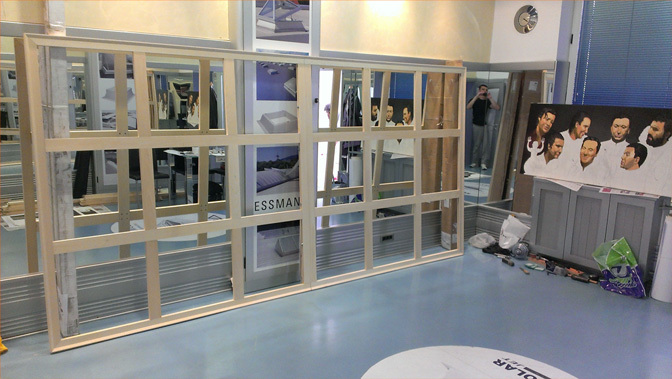 It turns out, we also have to reinforce the wooden bars in the back, using aluminum frames. It will keep everything rigid, so we can stretch the canvas properly. Otherwise, on this size, canvas would bend the stretcher bars, like in the bow. May 2014 – Finished aluminum construction and rolled out the canvas. Looking great so far, canvas is thinner than Masterpiece canvases from San Diego that I used before, but just as smooth and seems like it can take a lot of pressure from stretching. 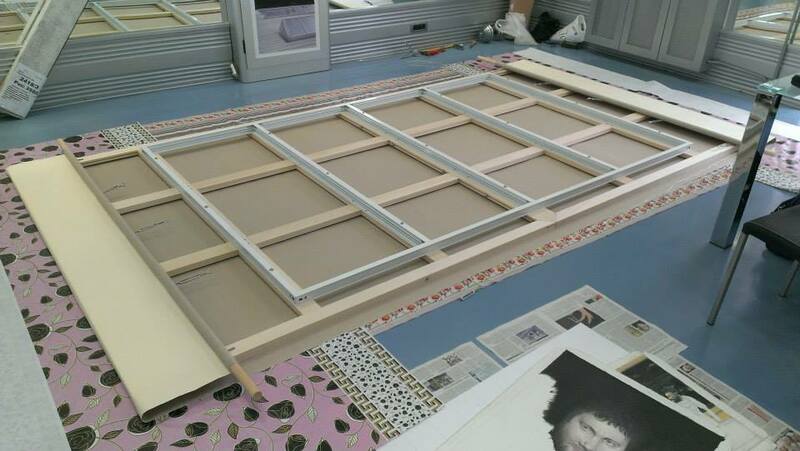 May 2014 – This is the system I developed for stretching 4 meters of canvas, since it’s impossible to stretch it by hand or with pliers. 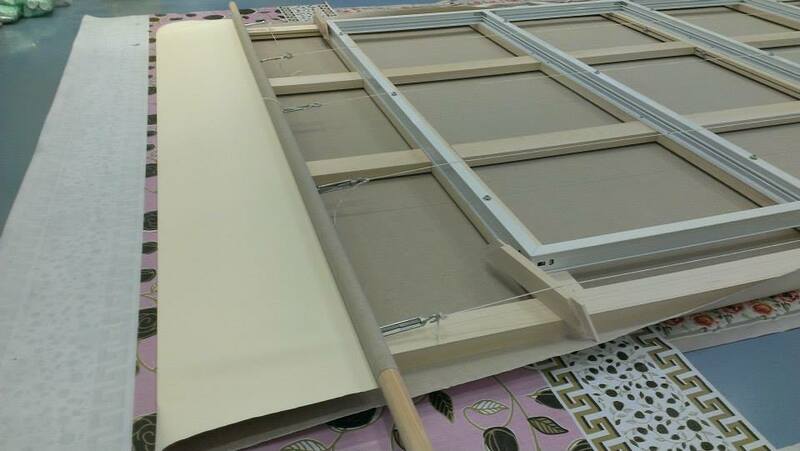 So canvas is stapled to wooden bars on each end, and they are connected by ropes and screws than will shorten the distance and tighten the canvas until it’s under pressure. I was worried a lot that canvas might tear, but it worked! May 2014 – Finally stretched the canvas, stapled it to stretcher bars, and lifted it up. It turned out to be perfect. 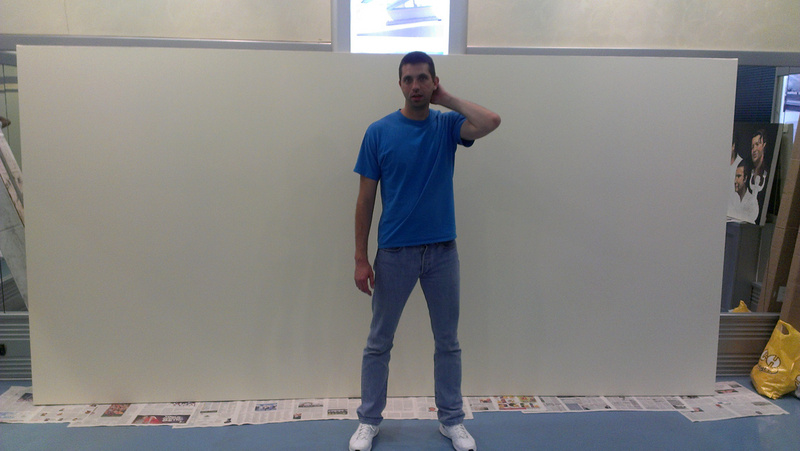 May 2014 – Ready to start painting! 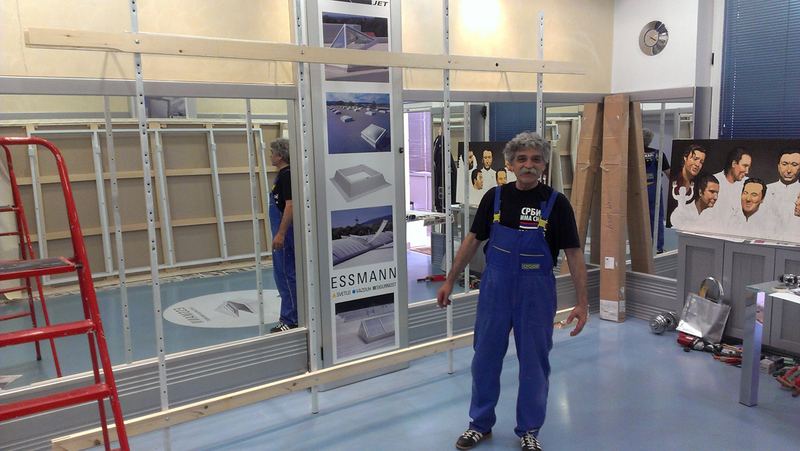 June 2014 – My uncle Mirko has been helping me build a metal construction to hang the painting onto, so I can raise it and lower it at will. He made an amazing yet simple design which has been a huge benefit. 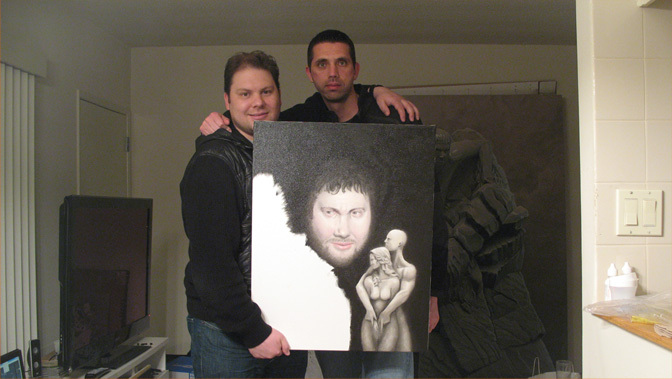 June 2014 – Hung the painting and started drawing. I drew all the elements in smaller scale, combined them and copied them onto large canvas with grid. It took about three weeks so far to draw the details. July 2014 – Officially painting for about two weeks now. This it the first rough pass of color, fine polishing will come later. But finally got to the stage where every day of work shows actual progress. No more testing, drawing, constructing, stretching. Just pure painting! 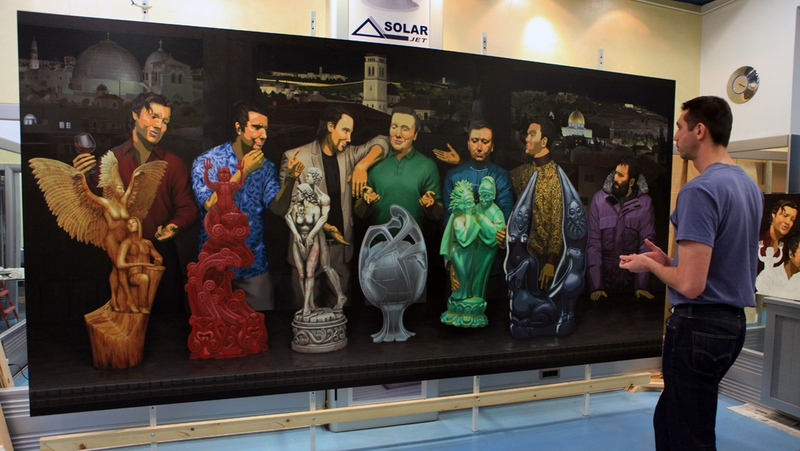 July 2014 – Painting compared to the rest of the studio. 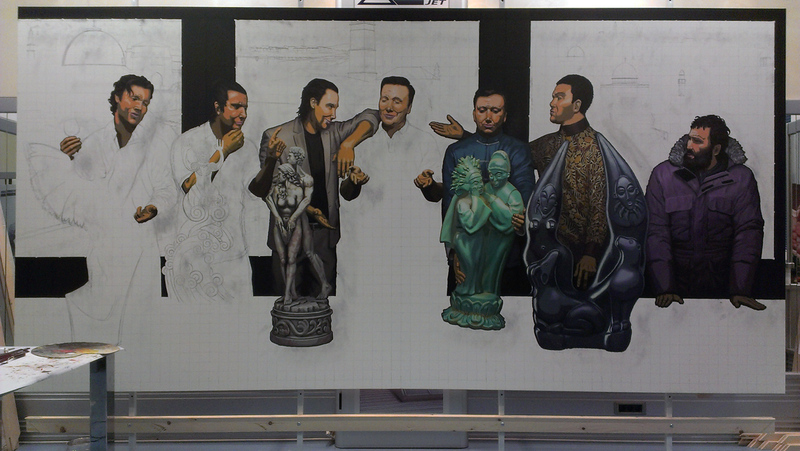 August 2014 – Working on the first rough pass; statues take the most time since they have the most details. Background should come in much faster. It is a night scene so most of the canvas will be fairly dark. October 2014 – I realized I haven’t posted anything for a long time. Working on the background for a while now. Some of the main buildings still aren’t there, as well as all the city lights – they will come in the second pass. Lots of stress and frustration about slow pace and all the details, and ultimately having the time of my life! I am planning to cover remaining canvas by late Nov/early Dec. 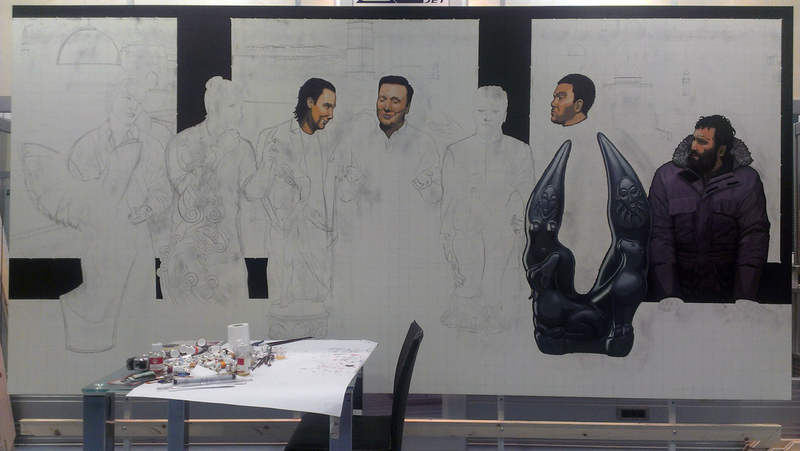 In the meantime, started to work on the leftmost statue. 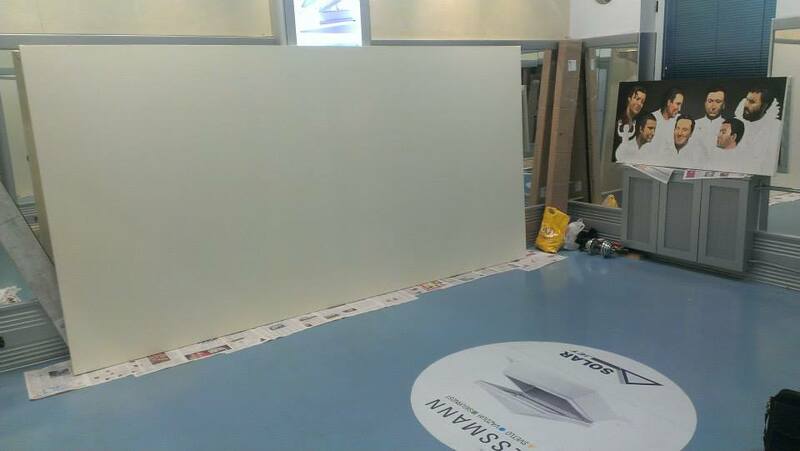 February 2015 – Finished the first pass, canvas is fully covered. Time to take a step back and look at the work so far. 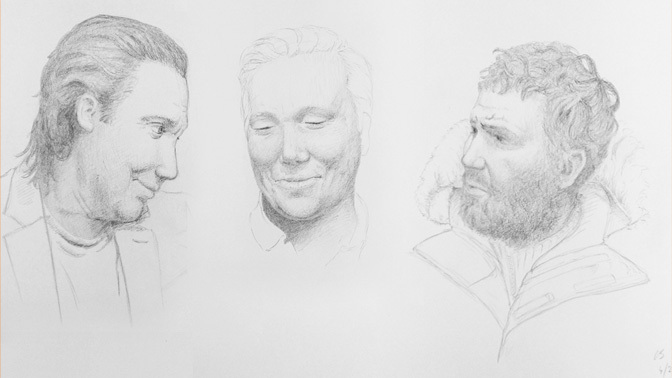 March 2015 – Working on faces. About to have previous 14 months of work merge together in next few short months. 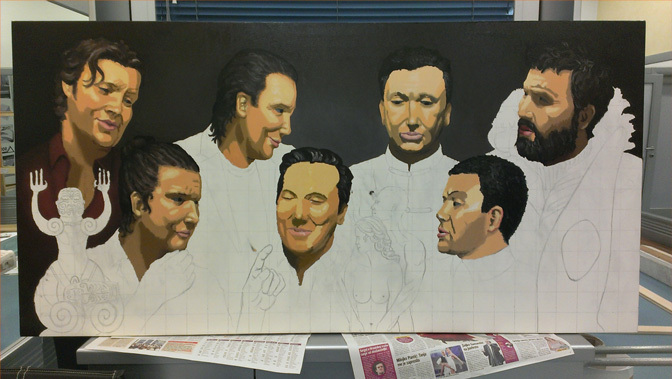 After going through the rest of the painting, I will come back to do one last final touch up of each face as necessary. May 2015 – I haven’t posted anything in a while, so here is the latest update. Working on second cleanup pass, going through details that aren’t visible from distance but matter a lot at close range. Finishing rightmost statue. Then I will start work on hands. Clothing is mostly done. Background has night lights added, before the final pass where I will smooth everything out and make a nice foggy evening lights.